Crawshaw Group PLC, the Rotherham-based fresh meat and food to go retailer, has announced details of its growth plans that will see it invest £200m, opening 200 stores and creating 2,500 jobs. The AIM-listed firm currently has 24 retail outlets throughout Yorkshire, Lincolnshire, Nottinghamshire, Humberside and Lancashire and recently moved onto Sandbeck Industrial Estate at Hellaby, occupying a 12,000 sq ft unit for the manufacture and distribution of specialist foods. Crawshaw has set itself an ambitious target of 200 shops within eight years. Last year it announced details of the placing of new shares in a bid to raise nearly £9m to support the acceleration of its store opening programme. Delivering on the plan rests a lot on Noel Collett, formerly Lidl's chief operating officer for the UK business, now chief executive officer at Crawshaw. Moving from three separate head office and factory locations into one newly refurbished facility in Rotherham involved investing £1m. This single location can now support up to 60 shops and also contains a new factory shop which is performing well above expectations. Over the next 18 months the Crawshaw Group said it will invest £25m, creating 375 Yorkshire jobs. 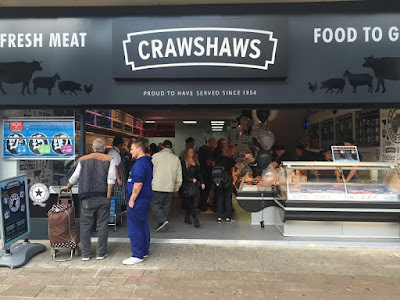 Crawshaw recently opened its first store in Leeds, at the Merrion Centre, and a Bolton store opened this month. A further four stores are planned to open before Christmas taking the portfolio to 39 stores. The company has also been growing through acquisitions and the expansion plans are to be supported by further distribution centres. Noel Collett, CEO of the Crawshaw Group, said: "I am thrilled to be involved in what I believe is the most exciting and scalable project on the current retail landscape. Our target of 200 stores is just the tip of the iceberg, with our unique fresh meat and food-to-go proposition, there's nothing to say that this scalable model can't reach 500 or 1,000 nationwide. We have recently opened new stores in Leeds Merrion Centre and in Bolton town centre, and the response from our new customers gives us great confidence for our future openings, so clearly we're eager to continue to build the momentum and deliver our expansion plans. "We have some fantastic people in our business and we are now looking to grow our team considerably, so recruitment is clearly a key focus for us at the moment. We are searching for 450 management positions, 400 butchers, 900 general assistants and we're investing heavily in helping young people gain employment by taking on 350 apprentices. "Our new stores show how our approach is working, we've already filled 30 new positions and are developing an intensive training programme, ensuring all new recruits receive outstanding training with transparent career opportunities. We're looking to recruit local people, from those who are just stepping onto the career ladder, to those with decades of experience, we're keen to hear from anyone who has a real passion for retail and wants to be part of a dynamic,fast growing company." Established in 1954, Crawshaw Group plc has been trading on the stock market since 2004. It was acquired by Felix Group plc in 2008. Specialising in larger value packs and multi buy offers, earlier expansion plans had to be scaled back following the economic downturn and the VAT changes on the hot cooked product offer. In its latest financial results for the year ended January 31 2015, Crawshaws saw sales increase by 17% to £24.6m which saw EBITDA (earning before taxes) increase 15% to £1.6m (2014: £1.4m). Excluding infrastructure costs the adjusted EBITDA was 30% higher than last year at £1.8m.